With Rapid Retail’s list of European clients growing longer and longer, the Bundesliga was never far out of reach. 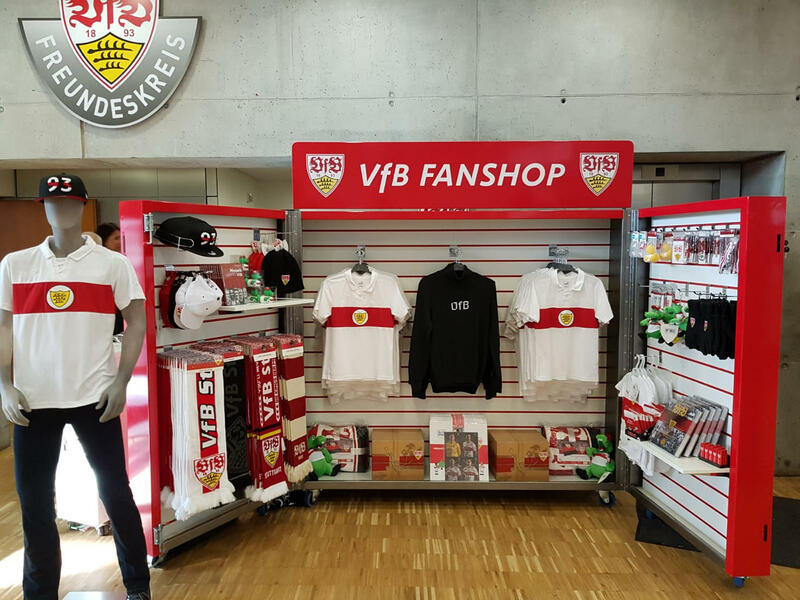 VfB Stuttgart have welcomed the addition of 2 new mobile merchandise displays to enhance the fan experience and capture those vital match-day sales at the Mercedes-Benz Arena. After a 1-0 victory over 14th place Augsburg on the weekend, VfB are looking to continue to improve their league form and move up the table from their current 15th position, just 2 points behind their previous opponents. With Mario Gomez currently leading the way with 3 goals and 1 assist in 13 games, he will be looking to make the difference in the upcoming fixtures before the mid season transfer window, where VfB may look to strengthen some of the weaker areas of their team. Gomez and Daniel Ginczek were among the stand out characters last season scoring 16 goals for Stuttgart shared at 8 each, making them joint top goal scorers for the club in 17/18. In their next game they face Borussia Mönchengladbach, who are currently in the midst of an excellent season, only topped by the exceptional performance of first place Borrussia Dortmand who have stormed ahead of the pack with 33 points in 13 games – a cool 7 points clear of their chasers. A glance at Stuttgart’s stats show us that they’re no stranger to stealing the ball from their opposition in crucial moments. Their other major skills include their wide play, taking the ball up the left side of the pitch whenever possible; their ability to hold a lead once ahead; their crossing into dangerous areas and even their confidence in taking long shots. We hope to see them put these abilities to good use over the remaining course of the season. As for their new RR solutions, Stuttgart saw the need for some mobile merchandising units – which can be placed pretty much anywhere – offering a flexible point of sale and an eye catching, branded display all wrapped up into one. There are little alternative solutions out there that offer the same level of versatility and allure, with club colours and badges tying them in perfectly with stadium decor. That being said, these units aren’t just suited to sports clubs. You can find these Rapid Retail units in train stations, safari parks and tourist information centers across Europe. There are limitless uses and options for customization, leaving only the merchandising down to you. If you’d like to find out more about our mobile merchandise displays, or any of our solutions, please feel free to give us a call on +44 (0) 1386 555044 for a free no obligation chat about how we can help you.